The recent cover story of Chemistry Open pursues the origin of the strong hydrogen bonds in Watson-Crick base pairs. 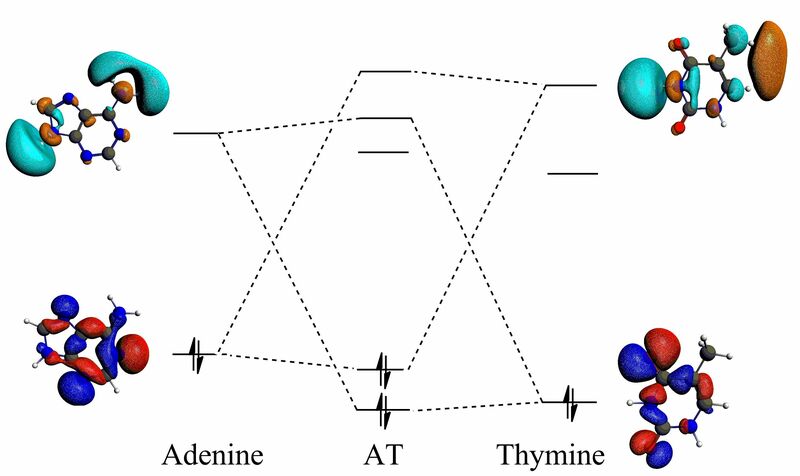 While the commonly held theory of resonance-assisted hydrogen bonding underlying this hydrogen bond strengthening has been contested previously, this study scrutinizes the hydrogen bonds in AT base pair by also studying analogues with a smaller π-framework, and even saturated (sp3) mimics. Using DFT-D3(BJ) calculations and energy decomposition analysis on the different AT-analogue pairs, it has been established that the π electrons do not enhance hydrogen bonding via resonance-assistence. Instead the π-framework only plays a role in terms of creating a stronger electrostatic interactions and better donor-acceptor overlap, increasing hydrogen bond covalency. Consequently, the sp3-mimics have hydrogen bonds that are half as strong as the hydrogen bonds in the AT base pair and its analogus with sp2-hybridized donor and acceptor centers.